Charter a private vehicle and plan your own route around Japan's greatest attractions on this 7-day customized tour. 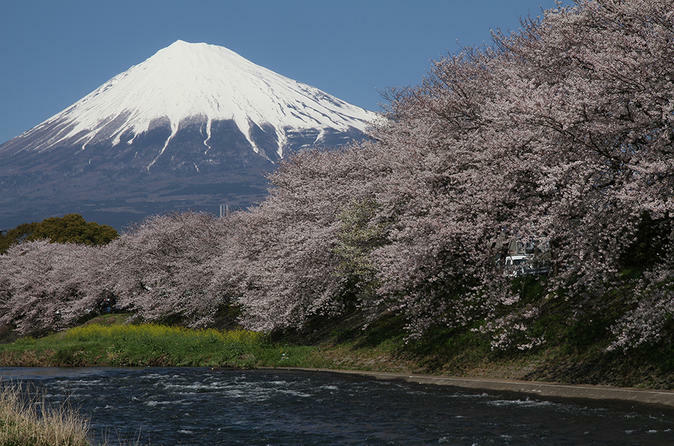 Begin in Tokyo and make your way down to Osaka, stopping in the Mount Fuji area and Kyoto along the way. This tour includes a private driver and you can also book a local guide to accompany you (at additional cost). Accommodation and meals are not included. When booking, confirm your preferred departure time and location with the tour operator. Your 7-day tour begins with a pickup from the airport or your central Tokyo hotel. The tour is fully customizable to your own interests and requests. Tsukiji Market: The world-famous seafood market of Tokyo. Many visitors spend enjoy eating lunch here. Asakusa: Historic neighborhood, known for the Senso-ji temple, entered via the Kaminarimon (Thunder Gate). Lake Ashi: Known for its views of Mt. Fuji and numerous hot springs. Kinkakuji Temple: Also known as the Temple of the Golden Pavilion, built in 1397. Kiyomizu Temple: Constructed during the early part of the Heian period (794 to 1185). Osaka Castle: One of Japan's most famous castles. Shitennoji Temple: The oldest Buddhist temple in Japan, built in 593 by Prince Shotoku, who first brought Buddhism to Japan. Dotonbori: Osaka's most famous shopping and entertainment district, noted for its historic theaters, shops, and restaurants. Your tour concludes with a drop-off at the train station or airport in Osaka. Please note: It is recommended to book and plan your itinerary at least two months in advance.